Repeal? Replace? 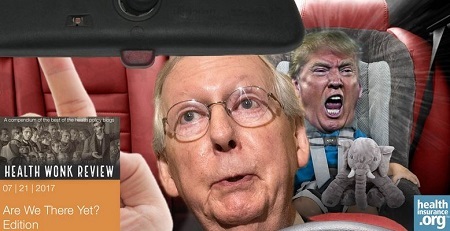 Steve Anderson has posted the “Are We There Yet?” Edition of Health Wonk Review at healthinsurance.org blog, a timely edition as a pending vote of one or another of the previous bills is scheduled to come before the Senate today — although no one knows for certain which Trumpcare bill legislators will be voting on – including the legislators themselves. Will it be just for a pure repeal, deferring the hard decisions to some future date? Or the House Bill? Or Senate Bill I, Senate Bill II, a hybrid, or some entirely new animal? Who knew healthcare could be so hard? Stay tuned. Needless to say, the wonks have opinions on this mess and are not shy about voicing them. Read what some of the best minds in the health policy blogosphere are saying. Farm work is dangerous work. Injuries and fatalities are gruesome – amputations, death by being caught in machinery or rolled over by tractors; drownings in manure pits; suffocation in grain bins. More than 5,000 agricultural workers in the U.S. died on the job between 2003 and 2011, a death rate that OSHA puts at seven times higher than average. The Idaho Statesman recently featured a troubling but excellent story by Audrey Dutton on two workers who drown in manure pits, a well-known fatality risk in agriculture. While all farm workers face risks – including child workers – the high fatality rate is worsened by the high rates of immigrant workers – both legal and illegal – who may have a poor grasp of English, or who are reluctant to make waves, particularly with the recent ICE crackdowns. These While many farms are good to their workers, there are also many who exploit them. These workers tend to be suspicious of government and unaware that OSHA exists or that they have rights. A complaint can put them at risk of getting fired or deported, Barab said. “This is a group OSHA has a hard time reaching,” he said. At Sunrise Organic Dairy in Jerome County, workers did not know about OSHA and were concerned about working near the manure pit the winter Vazquez-Carrera died, according to someone who knew him, who asked not to be identified because of fear of retribution. In addition to immigrant and non-English speaking workers, children are another vulnerable population at high risk of injury on farms. Small farms – particularly family farms – are unregulated because OSHA cannot inspect farms of 10 or fewer non-family workers, even when fatalities occur. Plus, many of the recordkeeping rules that OSHA was implementing have been rolled back, meaning that many injuries and deaths will continue falling under the radar. These statistics are important for targeting agricultural safety and prevention programs, as well as for targeting enforcement efforts. OSHA programs are cash-strapped and about to be even more so. Jordan Barab of Confined Space documents how the House budget devastates OSHA and MSHA enforcement. Having served as Deputy Assistant Secretary of Labor at OSHA from 2009 to 2017, he should know. In addition to enforcement cuts, many prevention programs will be affected – here’s a concrete example: Farm safety funding could be uprooted. The article talks about rollovers, which are the top cause of farm injury and death. But under the president’s proposed budget, one of the key prevention programs – National ROPS (rollover protection system) Rebate Program – would be hurt by budget cuts to the National Institute for Occupational Safety and Health. In the abstract, cutting regulations and federal budgets can seem like a good idea, but they can have real world health and safety implications. We don’t think worker safety or public health should be on the chopping block. These investments are often a cheap dollar. Measured in either lives or dollars, we earn incalculable savings through the prevention efforts of the Centers for Disease Control, OSHA and NIOSH. Earlier this year, the $11 million Chemical Safety Board was scheduled for elimination, but after much public outcry, the House budget calls for CSB funding to be restored.